My husband, G, upon tasting these paleo pancakes, commented “they taste real”. After assuring him the pancakes were not a figment of his imagination we proceeded to devour a couple of stacks each. The first thing I noticed, besides how good they taste, was how similar the texture is to traditional pancakes. But the most impressive difference was how I felt after eating the coconut flour version. There was no woozy feeling I usually get after eating pancakes. I did not feel the urge to take a nap and was not hungry an hour later. In fact, I stayed satisfied until lunch even after a morning workout. It started me wondering exactly what are the differences between traditional pancakes and these coconut flour paleo pancakes that could account for this noticeable improvement. So I did a little research and made a few calculations that show how the recipes “stack” up (pun intended). Coconut flour is very dry and absorbent so it takes less total volume in this recipe than if we were to use wheat flour. For example a similar recipe using wheat flour calls for 1 1/2 cups for the same number of servings compared to 1/2 cup of coconut flour in this recipe. That alone accounts for the big difference in calories and carbohydrates. The lower total carbohydrate means less of an impact on blood sugar making these paleo pancakes much less likely to cause a spike in insulin levels. This recipe also uses less sugar and the coconut nectar it does use is a low glycemic ingredient. Coconut nectar only has 13 grams of carbohydrate in one tablespoon versus the 36 grams of carbs in a similar pancakes recipe. Another benefit of coconut nectar (sap) is it contains 17 amino acids, vitamin C, broad-spectrum B vitamins and a nearly neutral pH. It is also thicker than agave nectar which makes it great for use as a “syrup” for pancakes. Coconut flour has significantly more fiber than wheat flour. The table above shows that even with triple the amount of wheat flour in the traditional pancake recipe the fiber content is still pretty minimal especially when compared to coconut flour. The net carbs for the coconut flour is only 12 compared to 126 in the wheat flour recipe. That is a HUGE difference and is a major reason these pancakes keep you fuller much longer. Coconut flour has more protein than the same amount of wheat flour. This recipe also contains more protein because it uses so many eggs. There are 4 eggs in this recipe versus 2 eggs in my comparison recipe. That’s an additional 12 grams of protein which means greater satiety after eating. Shannon at www.nourishingdays.com did the hard work of trial and error to come up with this fantastic recipe. Check out her site for some really delectable photos of these fluffy pancakes. I changed the ingredients to make them paleo and changed some instructions based on my own preferences. This recipe is also 100% paleo because it does not contain dairy ingredients. Obviously, if you have no issues with dairy you can easily substitute whole milk and butter for the coconut milk and oil. I recommend keeping the pancakes on the small side to make them easier to flip. 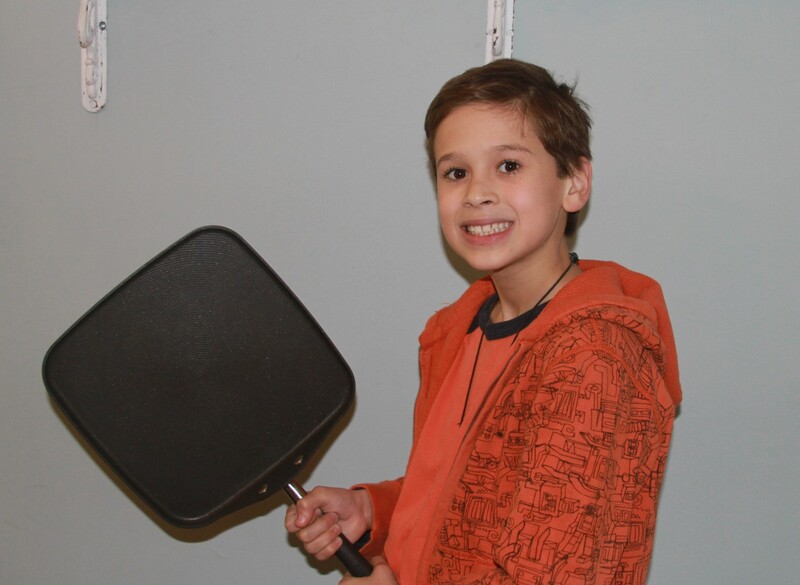 Preheat pan or griddle over medium-low heat. Beat eggs in a stand mixer until frothy. Mix in milk, vanilla, and coconut nectar. In a small bowl combine coconut flour, baking soda, sea salt and cinnamon and whisk together. Combine dry mixture with wet in the stand mixer and beat on medium speed for about 30 seconds. Scrape down sides of bowl then mix on medium to medium-high for another minute or two or until the coconut flour is completely mixed into the batter. Grease pan with coconut oil. Pour batter to create pancakes that are about 3 inches in diameter. If the batter seems too thin you may need to add a small amout of coconut flour to achieve the desired consistency. Cook for approximately 3 minutes, flip and cook an additional 2-3 minutes. Serve hot with coconut oil, coconut nectar, agave nectar, honey, syrup or fruit. I’ll be curious to hear how families react to these coconut flour paleo pancakes and how you think they “stack up” to the original. 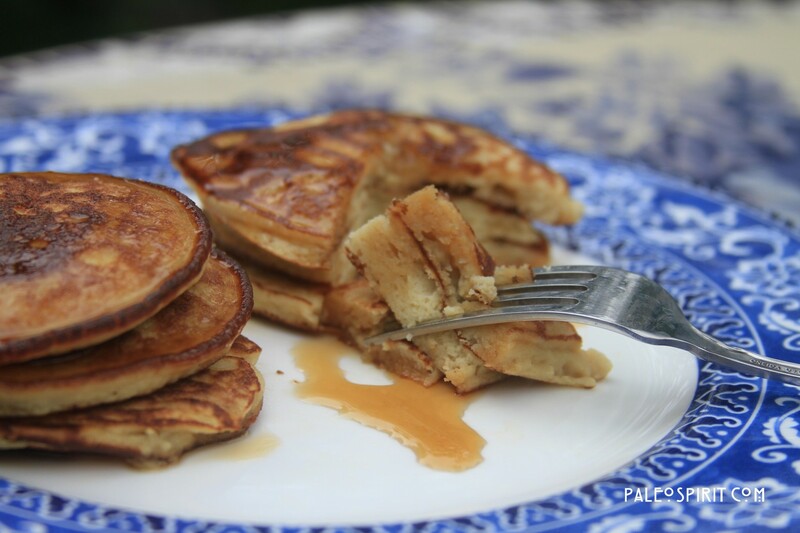 214 Responses to "Coconut Flour Paleo Pancakes"
WOW looks YUMMYYY!!!! i cant wait to try it..But i wonder if i cant find the “Coconut nectar” in my area can i sub it with Honey?? Sure. You can definitely use honey instead of coconut nectar. These look amazing. I ordered the coconut flower and will try. I will let you know how it goes. Stacey, they really are good. I hope they turn out well for you. And please do let me know what you think! This is exactly how I modified Shannon’s recipe as well (coconut milk/oil/nectar)…it’s the best one I’ve found. I have also used this same recipe and added pumpkin for awesome pumpkin pancakes! Thanks Andrea. She did such a great job I figured there was no point in reinventing the wheel! LOVE the pumpkin addition!! Can you share as to how much pumpkin to use? BETTER than regular pancakes. 5 year old approved! Subbed honey for coco nectar which I didn’t have on hand. Thank u! I always approach paleo & gluten free versions of food with a bit of trepidation but I was very pleased with the results of this recipe. I subbed regular whole milk for the coconut milk & honey for the nectar. I cooked these on a cast-iron skillet & discovered that the less coconut oil you use the better. The portions of the pancakes that had more oil seemed to cook much slower than the rest, so my first couple of pancakes had issues. They had serious issues flipping them, but after I corrected for the oil they flipped beautifully. Another interesting thing I found is that my fiance is very sensitive to overcooked egg, the flavor & smell, and while some of the pancakes got a wee bit dark, and I could smell & taste the egg, he didn’t seem to mind it. Maybe that has to do with the type of flour used? Thank you, Kathryn, for the feedback. Cooking pancakes in a cast iron skillet takes some practice. Sounds like you’ve got the technique down! I’m not sure why your fiancé does not react to the overcooked egg. This recipe certainly has a lot of eggs. But that’s one of the things I like about it – lots of protein and other good stuff! Like you, I have found that making the pancakes on the smaller size tends to work the best. Thanks again. I absolutely LOVE these pancakes!! I use vanilla coconut milk because that is all I had, and therefore I cut back on the added vanilla. I also used honey in place of the coconut sap, and added some chopped pecans to them. SO good! Cool! I’ve been making double batches and the batter doesn’t seem to be too different the second day. It’s nice knowing the kids are eating something that has good stuff in it and won’t shoot up their blood sugar. So glad you like them. Tried these tonight for dinner and really liked them. The hubby approved too. Had them with a bit of honey and fresh fruit. Thanks for the recipe!! I have tried cooking with coconut flour a few times now and every time was a serious fail. Then this afternoon I tried these, they were amazing! I’m definitely going to keep the coconut flour around now, I just have to get more comfortable using it. Yay! It is a tricky substance isn’t it?! I’m getting very accustomed to the denser feeling of foods made with coconut flour now. Thanks for the feedback. i don’t know what i did wrong. i made this twice, wasted 8 eggs in the process, and the recipe didn’t work. the batter stiffened up and they didn’t make good pancakes at all. i couldn’t flip them, they broke up in pieces, and they were just awful. how did they work for everyone else? the eggs were at room temperature and i did EVERYTHING exactly the way you instructed. was i not supposed to use the canned coconut milk? i’m assuming that you suggested eggs at “room temperature” so that the milk wouldn’t stiffen, right? well, i did just that and it didn’t work. i’m sorry if i sound mad, but food isn’t cheap and i just wasted a lot of money trying this recipe twice. the pancakes i’ve made with almond flour have worked way better. Crissy, I can understand your disappointment and frustration. You are absolutely correct these ingredients are expensive and it makes it especially important these types of recipes be accurate. I am sorry you had so much trouble with this one. I have made it several time with success. I have used whole milk as well as Silk brand coconut milk. I don’t see why canned coconut milk would not work either. The most sensitive variable in the recipe is the coconut flour. It really changes the recipe depending on how much you use. (For instance, you wouldn’t want to pack the flour down in the measuring cup, etc.) You also have to make sure the pancakes aren’t too big because that can make them difficult to flip. The baking soda should be fresh and you want them to cook enough on one side so they “set” before you try to flip them. Other than those possible difficulties I’m not sure what might have gone wrong for you. If you are just starting out with Paleo I can understand why this recipe would be attractive because it is a sort of “bridge” recipe. But don’t get too discouraged if this one didn’t work out. Stick with eating real food – meat, veggies, some fruit and good fats. Hang in there! I bet the problem is the canned coconut milk, which has substantially more fat than Silk brand coconut milk. (I just checked the nutrition facts in both….1 cup regular, canned coconut milk = 40 g fat, vs 1 cup Silk brand coconut milk = 5 g fat.) That much of a difference would really change the way the pancakes turn out. Hey Jess. That really is a huge difference in fat content. It could definitely account for the difference people have in terms of amount of liquid needed too. Thanks for the research! I’ve actually made this recipe using water instead of coconut milk & they turned out perfect! My bf couldn’t tell I had done anything different. Hi, I used canned milk and all I can think of is check the % content as you can buy milks that are only 45% up to 100%. I use Ayam Coconut Milk, it’s the best I’ve found in Australia. I didn’t get a smooth pancake like batter so I wasn’t sure how they were going to work out, and my coach had been saying working with coconut flour is difficult. I used a non stick frypan on an electric stove, set one notch below high. I wiped the pan with coconut oil and away I went. The first one also broke up and was a mess but the rest after I spooned them into the pan I flattened them out to quite thin and this made a difference. I also didn’t have coconut nectar so I used coconut water, just a splash. Another thing could be is your baking soda baking soda? I know I have used arrowroot by accident in recipes because I picked the product based on packaging and didn’t read the label. Keep with it, paleo is worth it for the great health benefits it brings. I made these too with no success, and tried several times. I will move on to another recipe until I find one that I really like. But the picture posted looked so good, I had to at least give it a try. Thanks for sharing this recipe. My family follows the specific carb diet and it differs somewhat from paleo but is quite similar. I make almond flour pancakes frequently but i was out of almond flour today and had some coconut flour so i googled a recipe and landed on your site. So glad i did! I had to improvise on ingredients. I used agave nectar instrad of cocnut nectar and i added chocolate chips…both of which are not legal on SCD but, well, it IS Christmas eve! Delish! I have never used coconut flour before and was amazed to see how much the batter thickened up. Btw, i used canned coconut milk which does seem a bit thicker than the kind in 1/2 gallon cartons. When i saw that the batter was super thick i poured in a little more coconut milk and they turned out great. Verdict: coconut flour pancakes-awesome; almond flour pancakes totally different but also awesome. So now i have more variety in my breakfast selections! I’m so glad to get your feedback, Lynne. My oldest son is allergic to nuts which means almond flour is out. Coconut flour is just about the only other option for paleo eating for us. We’ve added chocolate chips too. But don’t tell anybody. 😉 I’ve also discovered that you really have to tweak the liquid because the coconut flour is so dry. It really varies depending on how packed down it is when you measure it or if you are a tablespoon over or under. Good to know the canned coconut milk works. I use canned coconut milk in other recipes but find myself using the kind you find in the “dairy” section for this most times. Enjoy. And I hope you have a Merry Christmas! Mine are in the pan now.. doubled the recipe.. total glue.. trying to salvage with regular milk… should I add water? First of all, thank you for the recipe, I will be trying it as soon as you will reply to my question. Do you think I could use stevia instead of any other sweetener? But then, what can I substitute for that one tablespoon of liquid sweetener? Can I add milk instead? Or water? Since there is only a tablespoon of sweetener you can probably replace it with a very small amount of Stevia. I’m not sure of the conversion for that but I have read you can replace the moisture with water or milk when subbing Stevia for a larger liquid volume of sweetener. This recipe takes some tweaking of moisture already depending on brand of coconut flour, size of eggs, etc… So I think it would be fine to add the Stevia and then a bit more whole milk or coconut milk to get a good consistency only if you think it needs it. Please let me know how it turns out. I’m sure there are other folks with your same question. Good luck! Sorry, but I’m with Chrissy. these were a horrible gloppy mess. Didn’t hold together, didn’t flip, consistency was awful. glad they seem to work for everyone else. Didn’t work for me either. I had the same problem. Hard to flip. Took a while to cook through. I didn’t like the consistency either. I could taste the eggs way too much and they were dry. This recipe had too many eggs for my taste. I think I’ll try the almond flour ones also on this site but don’t feel I’ll try this one again. Appreciate the recipe though and the blog! I just fried the pancakes using 1/4 teaspoon powder stevia and did not have to add any liquid. In fact, I had to add a rounded tablespoon of coconut flower because the batter was too thin. Have to say that the pancakes were delicious, indistinguishable from the regular ones. This is a great recipe and I will definitely use it very often. Thank you again Lea! Thanks for letting know how it went with the stevia. I’m going to try that next time I make them. It’s amazing the different experiences people have with the same recipe. I had a friend contact me a couple of days ago saying her batter resembled cookie dough and she had to add a lot more liquid! I can only think it has to do with the brand of coconut flour. But who knows. Thanks again for the feedback. I don’t know if this will help or not but my coconut flour comes from Tropical Traditions. Another reason some people might have difficulty with the consistency of the batter is the humidity levels/elevation of where they live. The higher you live and/or the drier the climate, you will have to add more liquid. That’s a really good point, Iza. I think I need to update the post to make that very clear for the folks who may not read these comments. Robin, while I can’t say why your pancakes were a “gloppy mess”, I can share with you how I made them. First, I use all the ingredients of room temperature, not only the eggs. Then, like I said in my previous comment, I had to add a tablespoon of coconut flower to make the batter a little thicker and I think the most important, I made them small. I used only one tablespoon of batter per pancake. Having them so small, there was no problem flipping them over. Also, they soak up incredible amount of coconut oil in frying. I hope this will help you. Rena, I had the same experience with the honey/maple syrup. But I can honestly say that since we have been eating this way as a family my boys’ taste for sweet has definitely changed. So while they may want more honey right now I think over time you can rest assured their tastebuds will adjust a bit and you will see them asking for less and less sweetener. I accidentally put “original” applesauce (you know the one with high fructose corn syrup) in my youngest son’s lunch one day. He came home from school and told me, “I couldn’t eat that applesauce today because it was TOO sweet.” I nearly fell out of my chair! Thanks for the feedback. I don’t have coconut flour on hand, can I just put unsweetened coconut flakes in the food processor and turn it into flour? Jenny, Unfortunately I don’t recommend that. Coconut flour is very dry whereas the flakes in the food processor would be much wetter and not as fine. Let me know if you DO try it. I make coconut milk with dry flakes (soak 2 cups flakes in 4 cups hot water for one hour, then I stick it in my blender in batches. I strain it out using a smooth kitchen towel. With the pulp I dehydrate in my oven on a low temp. Once dry I stick it in my food processor and voila, coconut flour.) It doesn’t come out as fine as purchased in store, but it works fine for me. Hope this helps! I have just started doing the same thing! I put my flakes in the coffee grinder to make my flour. Tried one other coconut flour pancake which was a total fail but am going to try this! where the recipe calls for coconut milk: is this canned coconut milk or the coconut milk drink? I would imagine that the liquid consistency & fat content differences in these products would make a big difference in outcome. Looking forward to making these! I have used both the coconut milk drink (found in the dairy aisle) and whole milk. While I have not used coconut milk from a can for this particular recipe there are others who have told me (I believe even in some comments here) that they have successfully used coconut milk from the can. Well, I did not have coconut milk so I used raw cow milk. Worked out great. Maybe this will help others to know that it is OK to use cow milk. You’re very fortunate to have access to raw milk! It’s unavailable in my state. Boo! Thanks for the info that it worked in this recipe. These are great! I had a few mishaps at first with the flipping, but I still ate my mangled pancakes! I had to go lower with the temp and cook a bit slower and this worked much better! I’m glad you liked them. I agree about the lower temp. It does take some practice but it’s worth it. I was able to make one pancake because my batter looked like crepe batter =( … i tried using my blender to possibly make it thicker but it didnt work and i got 10 GREAT tasting crepes =( i used the exact ingredients, what should i do diff next time? Monica, based on several comments it seems clear to me that the thickness of the batter depends, in part, on the brand of coconut flour. Some people end up with thinner batter, like yours. And others have a “cookie dough” consistency. I suggest you try adding more of the flour a little bit at a time until you get a thicker consistency. Although, I’m kind of intrigued by your crepes. Makes me want to buy a crepe pan. I have not tried this particular recipe but I have baked with coconut flour a lot. I have a coconut flour cook book by Bruce Fife, and there is quite a lot of wisdom in the front of the book for problem solving. A big thing is that many times the flour has absorbed moisture from the air because it was not sealed properly. also it HAS to be sifted with the baking powder, and the baking powder needs to be fresh. Thanks for that tip, Tracy. I definitely want to check out his book(s). Coconut flour is terrific but a little tricky so an investment in something that explains how to use it would probably be worthwhile. Made these yesterday. Substituted maple syrup for the nectar but that’s the only change. Hubby and I LOVED them. They melt in your mouth! I added lots of little blueberries. They are so much lighter than wheat pancakes! Definitely a keeper. Thanks Olivia. I’m glad you liked them. I appreciate that you linked back to me too. You have a very nice blog. can you use water instead of coconut milk? You could probably make them with water. Clearly the taste won’t be as rich as with milk or coconut milk. There will also be less fat in the batter which might impact how they cook. Let me know if you try it with water and if it works out. I made this recipe twice for my grandson. The second time I cooked them in my waffle maker. It was way easier and turned out great. I always freeze the extras for a snack when he wants them. Thanks for posting your recipe. I am always looking for new things to make for him. That’s great, Nancy. I love to hear about how recipes work for the little ones. I might just replace my broken waffle maker afterall. Just made these today. Makes a lot more than I expected. I actually found them to be nicer cold, maybe because I’m not a big syrup fan. I just topped one with this http://stevepaleo.blogspot.com/2011/04/paleo-chocolate-pudding.html ad now they are totally to die for!! Totally helped satisfy my craving for Ferrero Rocher! Thanks for sharing! My first recipe with coconut flour. These will do for an occasional pancake fix but the egg flavor is a little too palpable for my taste. Also, not sure if I over mixed the wet and dry ingredients but they weren’t fluffy. Maybe next time I’ll let it sit to incorporate the lumps instead of mixing the lumps out. I just have to let you know that I am in love with this pancake recipe! Make them everytime I get a chance. My two year old loves them too. We have them with some honey and a handful of walnuts,yummm!!!! Thank you for sharing your recipes! I appreciate that you took the time to tell me about your experience. So glad you and your little one like them! This was the first Paleo pancake recipe that actually worked! Other recipes I tried didn’t cook the batter well enough and looked like oatmeal, even though it tasted pretty good. I think the coconut flour tastes better than the almond flour. The coconut flour pancakes were delicious! I put cinnamon and blueberries in it as well. Like others said in previous comments, it has the texture and taste of pancakes, which certainly enhances the experience! Those who haven’t tried them don’t know what they are missing! That’s great feedback. Thank you. I still have yet to try almond flour pancakes because my oldest son is allergic to nuts. So it’s interesting to hear your thoughts on coconut versus almond flour. These were a bit of a flop for me. We ate them but…. I think I added too much extra coconut flour. The batter was as runny as plain milk. I added 1, then 2, then 3 spoonfuls of flour which, I think, ruined them. Also might have had too much coconut oil in the pan? Anyway the first batch burned and the second batch was just too dry. I added blueberries but not sure that helped/ hurt. Luckily I had blueberry sauce on hand and that helped with the dryness. Moral of the story? Like another poster mine were like crêpe batter and maybe I should have gone with that. Well, thanks for taking the time to give feedback even though you didn’t find a lot of success with the recipe. A lot does depend on the moisture content of the flour – how it is stored, humidity, etc… And keeping them small makes a difference. It had been a long time since I made pancakes of any kind prior to this recipe so I had to practice my pancake flipping skills a bit before getting the hang of it. Better luck next time if you decide to try again. mindblowingly good! I used organic grade b maple syrup, raw local grass-fed buttermilk instead of coconut milk, and served with tons of raw local grass-fed butter and maple syrup (i’m into nourishing traditions and am fortunate enough to live near a great farm!) I was stunned at how amazing the texture of the pancakes was. So fluffy, but with a nice solidity too. There’s a slight dry quality, but the butter and syrup counteracted that. One thing — I made my first pancake a little on the large size, and quickly understood why it’s good to keep these small. No gluten in the flour means that they don’t bind in the same way as wheat-based pancakes — they’re more delicate. Don’t make them bigger than a spatula and you’ll be fine. All in all, I’m pretty impressed by what can be done with coconut flour alone here. Thanks for the great recipe! I just finished making these about half an hour ago. Mine turned out kinda dense, and the egg flavor was too much for me. I still ate them, of course, but I’ll probably try a few other recipes to see if I like another any better. My batter was thick, and I had to add more liquid to get it to a good consistency. I didn’t have coconut milk on hand, so I substituted it with almond milk. I also used honey instead of coconut nectar. I just saw someone post on another website with a similar recipe that theirs turned out the same: dense and egg-y. I wonder if my eggs were too cool or if I over-mixed. I’ll have to try these again soon. It does take some practice because the temperature of the eggs, moisture content of the coconut flour, size of the pancakes, amount of oil on pan, etc… all seem to make a bigger difference in this recipe than regular pancakes. Good luck! 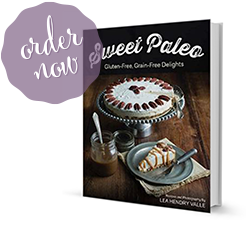 Hi Lea, I wanted to Thank You for your Paleo tweaks to this recipe! My four year old daughter and I have recently turned Paleo for health reasons. I can’t believe how on first try, the cakes were perfect texture and flavor. I just used my regular blender since I don’t have a mixer; it worked just fine. I’m super excited to see your other posts! Thank you so much for this recipe! I was worried about getting a thick batter (like what other commenters had said) but when I tried it today, the batter actually came out a little too thin. I’m not sure if the humidity was a factor here — I live in the Philippines. I added maybe 2 or 3 tablespoons more coconut flour and the consistency was more to my taste. They are hard to flip, but they look so nice when you’re able to flip them perfectly! They’re very filling too! Just a few things I changed: I used coconut cream because I didn’t have any milk on hand (I diluted it a little bit with water). I omitted the vanilla, and I used olive oil for the pan. Aya, I’ve come to the conclusion that everyone will have to “tweak” this recipe to get the right consistency. It sounds like you found a perfect solution and I like the idea of using coconut cream. Yum! Definitely best to keep the pancakes on the small size so they are easier to flip. I made these today as I didnt want to miss out on pancakes on pancake day here in the uk after following the primal blueprint…. I think they will be awesome if I can just get used to it lol…. Yes, the texture is a bit different. I think almond flour has a texture a little more similar to “regular” pancakes. But my son is allergic to nuts so we stick with the coconut flour. Honestly, I am so used to these now that I don’t miss the other kind. I especially don’t miss how I felt eating wheat flour. I gave these a whirl in honour of Shrove Tuesday and they were GREAT! A bit tricky to flip and I DID make some ugly ones, but they still tasted great. And I did get the hang of it I the end. I live in maple syrup country and I guess my taste buds have changed faster than I thought they would. I absolutely couldn’t put syrup on them. 🙁 Butter and strawberries were all that I needed. Thanks for a great recipe! Tried your recipe today as part of following the paleo diet and really found the pancakes to be a good option! They were tasty with cinnamon and nutty whole wheat sort of taste, without the wheat! Topped with fresh strawberry sauce was all we needed…..will make this again…. thanks. these were delicious! Especially w blueberries in them. I threw everything in the blender and accidentally added too much coconut milk…oddly my batter was super thick. I added two tablespoons of melted butter to try to thin the batter – it was still thick but they cooked up wonderfully. I used a small ice cream scoop and carefully flattened them. Thanks for the delicious recipe! Loved the texture and the slight coconut flavor. I used honey vs sap. All in all great… but had a bit of a strong after taste. Too much salt/baking soda??? Anyone have thought? I’m not sure which taste might be coming through too strong. I know my tastes have changed a bit since switching to paleo eating. Sweet things seem sweeter and salty things taste saltier to me now. So perhaps you are extra sensitive to the salt? I agree with you about the coconut taste – I like it. But some people don’t even notice it. Maybe you are a “super taster”? 🙂 I have a son who is one. YUM! SUPERTASTERS UNITE! Made these again this morning. 1/2 batch, with upped vanilla, and cut the sea salt. Even have some for leftovers. We’ll see how they re-heat! Mmm more vanilla would probably be great. I recently bought some double vanilla which gives a stronger vanilla flavor with the same amount of liquid. I’ve reheated these pancakes and thought they were still good. Hope it went well for you. Isn’t it great when you find something everyone likes?! So glad it worked out for you all. Wow Jamie. I know other people who have to go down that really strict path of eliminating nightshades in addition to other paleo diet restrictions. I’ve even heard of people who have to eliminate eggs in addition to nightshades if you can believe that! 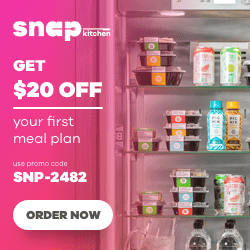 When I have more recipes on this site my intention is to categorize them in a way that will make it easier for folks to find what suits them and their health needs. Kudos to you for taking care of your health even though it can be difficult. I know the feeling of being discouraged when you have seemingly daunting eating restrictions. That was one of the things that was SO EXCITING when I found the paleo way of eating. Suddenly there was this whole world of amazing, beautiful, tasty recipes on tons of websites that meet my restrictions. It made me feel so much better. I’m glad you found my site and that you liked the pancakes. Best wishes to you! I *love* these,… But I must admit,… I cheat. I don’t ever wait for any of the ingredients to be room temp. Seems to work okay for me, but while browsing the comments, it seems like I might be the only one who can get away with this,… I use Trader Joe’s canned light coconut milk. I do use coconut nectar, but I don’t add the salt because since I’ve been eating Paleo, I notice that things taste way saltier than they used to (so I just don’t add salt anymore). I also just use a whisk to mix all the ingredients together. I don’t have a mixer or a blender and it seems to work ok.
I’ve cooked them in coconut oil and I’ve also cooked them in butter. Both came out great, they just have a slightly different flavor profile. Thank you for this fantastic recipe!! My kids had the same reaction. It was like, “oh, maybe I can get on board with this paleo thing if I get to have pancakes now and then.” It helps. My boys don’t ask for grilled cheese or mac n cheese anymore. We never really did a lot of it before and they have slowly adapted – or maybe they just know it’s a waste of breath? 😉 You could try making some paleo bread (there are recipes for that online even though I don’t have one here) if you are tapering off the grilled cheese with the kids. I just made these, instead of coconut milk I used a combination of almond milk + banana. I topped them with some of my homemade chocolate coconut butter and a little maple syrup and they were great! Homemade chocolate coconut butter? Mmmmm! Oh my, that sounds good. I’ll bet the banana added some nice moisture and density to the pancakes. Thanks for the review. Hello, I started Paleo with a Whole 30 which I finished on Tuesday. I thought I’d treat myself today. I used maple syrup in the batter and they were very sick so I added more coconut milk…. And then they were too thin. The first batch fell apart bit, so I stirred in 2 tbsp of coconut flour and started using my cookie dough scoop so that they were smaller. They were great. I’m about to try them out on my Paleo resistant family. I have 13, 11 and 7 year olds and a hubby who don’t think they need to change how they eat. It will be interesting to see if they even try them! I added chocolate chips to the 2nd half of the batter for them hoping it makes them more appealing. I’ll let you know how it goes. Oh, I used canned coconut milk. I’m in Cananda and the brand I used is called Grace. Anyhow, I made them yesterday for lunch, halved the recipe, subbed coconut milk for grass-fed whole milk and the coconut nectar for some raw honey. I used 2 eggs straight out of the fridge and blended everything with a hand whisk as our mixer is broken. I did not run into any texture problems whatsoever! Totally kept their form quite nicely. I found cooking them in coconut oil was better than in butter, they burned slightly less and cooked more evenly. I do agree with some of the other posters that they did have a bit of an eggy taste. I think next time I’ll add pumpkin or some sort of fruit to mask it up. I have a feeling maple syrup instead of honey in the batter would also help some. I was wondering how many pancakes this recipe will yield. I want to make these for my family of 4 this weekend and am thinking I need to double the recipe. Also, will unsweetened almond milk work here? That’s what I use when I want to eat pancakes since I have a dairy intolerance. I think I might need to add more sweetener to the batter to make up for the unsweetened almond milk. Thoughts? The actual number of pancakes it makes depends on how big you make them. We’re a family of four (an 11 and 7 year old) and usually one batch is enough. I’ve doubled the recipe several times but end up with enough for the next morning. So it really depends on how big the appetites are in your family too. I’m not sure what to tell you about the almond milk. Isn’t it sort of sweet naturally? The coconut milk I’ve used in this recipe is not sweetened. Again, it really depends on your taste. I just recommend you keep the recipe as is initially and if it isn’t sweet enough it certainly will be by the time you add some maple syrup or fruit, etc… Good luck. Thanks! I will make the recipe at stated using the almond milk and then make the necessary adjustments next time. If it’s not sweet enough, there’s always maple syrup! 7-yr: “These are gooood.” 5-yr: “Yummy!” 3-yr: “Are there any more?” (before he even finished the first one). I don’t think I’ve made the kids Paleo pancakes before. I asked what they thought was in them and my 7-yr guessed squash lol. I didn’t have coconut nectar so used agave for that and subbed a different “milk” but otherwise followed the recipe and served them with maple syrup. I mixed this in the blender for easy cleanup. They took more than 3 min per side with my griddle set at 300F so the kids got to practice patience. I might add more cinnamon next time – certainly there will be a next time! Thanks for the recipe. Excellent! Your kids obviously have great taste. 🙂 I agree there could be more cinnamon for cinnamon lovers. Thanks for the feedback. These pancakes are amazing. I’m actually still in the process of cooking them – I just tasted the first one myself, and wow – it really does taste like regular, wheat flour pancakes! I bet if I don’t tell my husband what kind of flour is in these, he won’t even notice the difference. I used honey instead of coconut nectar and buttermilk instead of coconut milk. Yum! Thank you. Let us know if he can tell the difference! Having read all of the many comments, I was prepared to take the time to experiment and adjust as I went along. Followed the recipe almost exactly, using canned coconut milk (which I know is higher fat than the milk used to create the recipe), and reducing the salt by about 1/8 tsp, increasing the vanilla to 1 TBSP, and adding 1/4 tsp of nutmeg. The coconut flour I used was a different brand than that shown in the link. I used a square nonstick griddle pan with ghee as my pan oil. My initial batter seemed a bit thin, but I wanted to try it that way first. Used a cookie scoop to pour a small pancake. The batter just seemed to sit there. At 3 minutes, then 4, it was gooey and un-flippable. I couldn’t even get the spatula to go under it. To the remaining batter (1/2 or so of the original recipe) I whisked in about another TBSP of coconut flour. This was plenty to thicken up the batter to a consistency that is more like my conventional batter. This batter sat thickly on the griddle at first, but spread a tiny bit as it cooked. 3-4 minutes seemed about right for the first side. I began to notice that the pancakes are only flippable when they’re *ready* to be flipped! I also noticed that this readiness coincided with the point at which bubbles near the edge of the pancakes popped and stayed open. The second side only needed about 2 minutes of cooking. The surprise was how much better I liked the flavor of the thicker-batter pancakes. It made a huge difference for me. The difference between not caring about making them again, and thinking these could become part of the regular “special breakfast” rotation. So, thanks for the recipe, and thank you all commenters! Wow, what a detailed description of your experience. I think your comment will help others in the same situation. I agree the thicker batter works better. And the times you gave for each side are true for me as well. I normally use almond flour for everything, but I’ve had a small bag of coconut flour sitting in my cupboard for months and decided to try this recipe. The bag was, unfortunately, open the entire time I’ve had it. I’m positive it soaked up plenty of moisture as we have a swamp cooler running pretty much 24/7. It wasn’t wet though–still seemed like flour. I changed the recipe because of what I had on hand. 1 1/2 cup coconut cream (from the can of coconut milk that had been in the fridge so the cream had risen to the top, so I scooped out just the cream and left the coconut water). Beat thoroughly. Batter was a little thicker than regular pancake batter–I’m guessing because of the cream. The pancakes turned out BEAUTIFULLY!!! The coconut cream added an amazing richness. I only could eat two small pancakes and was super full. Super filling. Not egg-y at all. It’s truly amazing how filling this food is, isn’t it?! I used to be able to eat huge stacks of pancakes and then be hungry in an hour or two. Now I eat a few of these and I’m full for hours and hours. THanks for the detailed information about your method. I do not have coconut nectar but I have coconut sugar. Do you think that the sugar will be a good substitute? Would I substitute it in 1 to 1 ratio? I am looking forward to making it. Already drooling! The coconut sugar might take a little longer to melt into the batter but would otherwise work fine. You could also try using honey if you eat that. These are fantastic! I’ve made them several times now using So Delicious unsweetened coconut milk and honey. The batter is so thick it takes a bit longer to cook (and flipping is tricky) but the pancakes are always delicious. Thanks! These were a bit messy but delicious! As I made them I read comments and that helped make them easier to flip. My three children all ate them up and my two year old is eating them without syrup like finger food! I added a banana and used honey instead of coconut nectar. Thanks for a great recipe! Out shortly after and neither one of us felt weighed down or sluggish at all 🙂 thank you for the amazing recipe! You’re welcome! I love to hear when the “uninitiated” enjoy these pancakes. I agree about how we feel after eating them. I can go for hours after eating these pancakes without being hungry. Thanks for the feedback. These were amazing! I made these before but haven’t had a chance to thank you for the recipe. I make them as waffles and today made them adding 2 tbsp pistachio flour (ran out of the coconut) and were so good! I am trying to get my dad to eat healthier foods (he was diagnosed with cancer in January) and Mr. I Don’t Eat Healthy Food, can’t stop eating these. The funny thing is that he didn’t even like normal pancake before! So, thanks again! haha… “stack up” ; ). Going Paleo from Monday – will try these out 🙂 They look great! I’m glad you appreciate my cheesy pun. 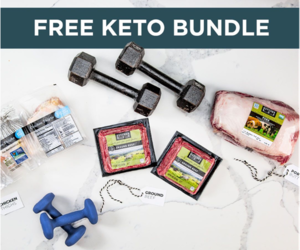 🙂 Good luck with the change to Paleo! I’ve been paleo for 3.5 years and my husband and I limit the “bread-like” items we eat so we don’t tempt ourselves to go back to SAD (I used to be a huge pasta junkie). I’ve made many of different types of “pancakes” for special Saturday mornings since going paleo with ingredients like pumpkin, almond, sweet potato, banana, chocolate chips, and your average “plain” pancake batter. This recipe is by far the best recipe I’ve come across and was the most fluffy pancake I’ve produced since going without grains. I make my own vanilla extract, so I just used straight vanilla beans instead of the alcohol extract and I also used maple syrup instead of coconut sweetener (I love maple syrup…stemming from my upbringings on the East Coast). 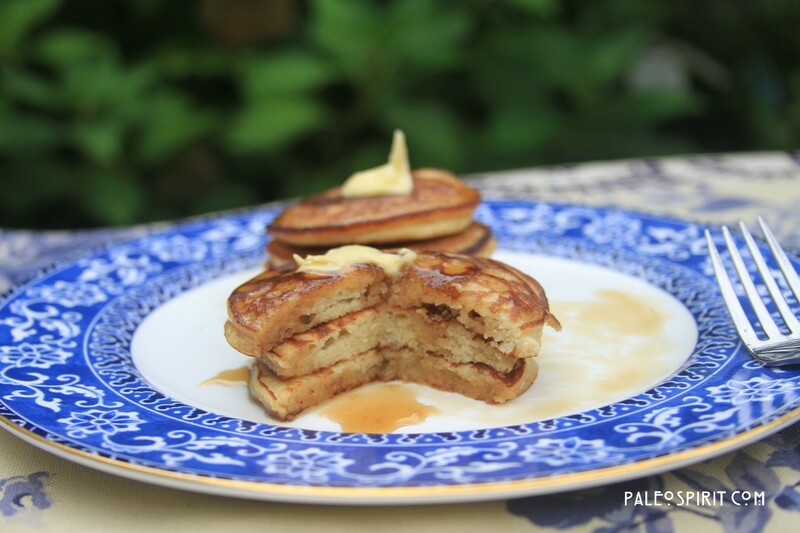 I’ve swapped in these pancakes for visitors of the non-paleo type and they love them, too! Coconut pancakes aren’t a popular flavor for the SAD, which is sad. I’ve also made these pancakes with some chocolate chips for a special birthday brekkie. Thanks for finding the sweet spot for paleo pancakes! So wonderful!! I made a couple of modifications – agave nectar, raw milk, organic blueberries, and cooked on griddle with a brush of grass-fed butter. I am totally enamored with these – my kids, who sometimes complain that “everything you make tastes like coconut” (primary cooking oil is coconut) thought these pancakes were delish. I love that I can make healthy and delicious pancakes for my family without sacrifice – thank you! Thanks for the feedback Rhonda. I know what you mean about coconut. My youngest who does not have a nut allergy would prefer almond flour but we stick with coconut flour for my oldest. You’re right this doesn’t have that standard coconut flavor. Would someone who had success with this recipe be willing to give me a weight in grams on their 1/2 cup of coconut flour? I hope someone else can chime in because I have not measured it in grams. But given the wide range in experiences I think I need to invest in a scale. Also, brands of coconut flour can vary rather widely. I’ve seen ranges online for 1/2 cup anywhere from 45 to 59 grams. Another new to paleo guy here…and boy was I happy to stumble across this recipe! The only mixer/beater I have is my arm and even so…these turned out perfect! I was surprised how perfect they were…usually my regular pancakes were a disaster. But…not these. Thank you! Also…I used canned coconut milk…jus the less fat version. Was Whole Foods brand organic light coconut milk. Again…thank you for this amazing recipe! Great. It’s nice to know they work out when made the “old-fashioned way”. I loved the flavor of these. But I couldn’t get over the texture. They didn’t give a fluffy pancake texture but a fluffy egg texture. I’ll try to make them again and see if I like them more. I’m sad I don’t like them as much as I wanted to because they taste awesome! Wow, these were REALLY delicious! Moist, fluffy, flavorful and filling – what more could you want in a pancake? 🙂 I used coconut palm sugar in place of the nectar – about 2-3 tbsp, and added it to my dry ingredients before combining. They came out great, just needed a little patience with the lower griddle temp (medium worked for mine). These pancakes are really really delish! I love them, my 1.5 year old loves them as well 🙂 I love them for breakfast or a snack. Thanks for sharing! Its terrific when adults like the pancakes but my heart melts when I hear the little ones like them too. Thanks for letting me know. I made these today – subbing honey for the nectar and water for the milk — they came out amazing — my batter was thin, which is actually refreshing from doing other GF recipes with other flours and I had to spread the batter with my fingers it was so thick — I accidentally put too much salt in, but it didn’t ruin them… I’m so happy with this recipe! I just made these pancakes about an hour ago. I read the posts when I found this recipe, so I knew what to expect. They were a little hard to flip, but keeping them small helped a lot. I smeared honey apple butter on my pancakes. I really enjoyed them. I ate 4 and I felt decently full. Thank you for sharing this recipe. I’ll definitely be making these again! They sound amazing! How many pancakes does the recipe yield? It’s hard to say because it really depends on how large you make them. I would estimate about 12-16. The amount of batter is more than 2 cups. I made 16 small pancakes from this recipe. I’d say it’s 4 servings of 4 pancakes. I had a few larger ones in the batch, but not much bigger than the standard spatula- had trouble flipping those pancakes. Best Paleo Pancakes! I have had the problems Jess talked about w/ other recipes….I used Trader Joes coconut cream …. It’s very thick so I blended it in my mini blender (magic bullet). This creates a thick creamy milk. I also believe your mixer advise was the key to my success as I have always used a whisk by hand. I did notice as I timed my mixing of dry and wet when I was finished I had the perfect consistency! I have not had that success by hand mixing. I did use almond extract as I was out of vanilla. Very delicious and filling! My teenage daughters enjoyed too! Thank you!!! I appreciate you posting this recipe, however, I’m confused. I made this recipe with 4 room temperature eggs (only subbed in agave for coconut nectar) and the pancakes came out like a glob of mush. I’m not sure what I did wrong but I’d like to fix it so these pancakes can look as good as advertised. Varying results are almost always due to differences in the moisture content of coconut flour or how packed it is when you measure it. You will probably find some pointers in the comments section if you scan it because there’s been a lot of discussion on the results. Better luck next time. Okay, I think I understand what you mean. In this case, I used Bob’s Red Mill Coconut Flour. Do you think putting the flour in a sifter would fix the problem? I used Bob’s Red Mill Coconut flour and didn’t have a problem (it was a freshly opened bag). I cut back the eggs to three at almost room temperature and the batter consistency was perfect. I would agree with cutting the salt a bit. I also cut the vanilla a bit, to 1 1/3 teaspoons, and think I should have left it at 2 or maybe more. I cut the honey to about 1/4 teaspoon — gave up because it was too hard to mix in and I was in a hurry — but think that was a mistake. Next time I’ll go with agave syrup, maybe. The hardest part was getting them cooked enough to flip without getting them too dark. They seem to brown very quickly. I turned my heat way down.Tried to cut back on the amount of coconut oil I used to cook them but they started to stick. I served them with sliced banana (good) and microwaved frozen raspberries (great). Four little pancakes and I was stuffed. Just made these…soooo much like traditional pancakes! I subbed maple syrup as I didn’t have coconut nectar. Also, I found if I turned the burner on low and put a lid on the pan, they cooked all the way through and were easier to turn. Then, I flipped them to crisp the other side. Also, for those whose batter was runny, mine was at first, but wait a few minutes and when the coconut flour soaks up some of the liquid, the batter will be perfect! Fluffy, crispy, delish!! Thanks for the recipe! Michelle, Thanks for the tip about putting a lid on the pan. I hadn’t thought of that. I’ll have to try it next time. I was looking for a low carb pancake recipe and found yours. I am going to try it this weekend. 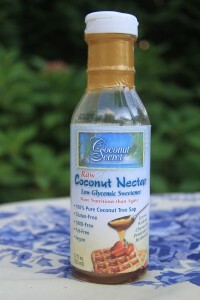 I will replace the coconut nectar with orange flower water (I love the taste).I just can’t wait! I am definitely going to try these. The last recipe I had for paleo pancakes were not very good. Too heavy. I think maybe I should have ground up the almonds a lot more. These at least look like real pancakes and look delicious. YUM! Hello – these sound great! How many pancakes does this recipe yield? Thank you! These pancakes have been a great go-to recipe for us! I’ve added raisins to them. I also sautee bananas in coconut oil. Recently I caramelized raisins, walnuts, and pumpkin seeds in maple syrup to put on top of the bananas on top of the pancakes and it is amazingly delish!! Ooh, that sounds really good, Dalena! I want to try the raisins, walnuts and pumpkin seeds in syrup! I made these delicious pancakes but had to change a few ingredients around to suit what I had at home. They were really light and very tasty. I was worried the coconut flour might make them a bit dry and may have needed more liquid ingredients but they were perfect. I just found this recipe and would love to try it, however, I’m allergic to egg whites so need to keep my egg consumption to a minimum. I was wondering if anyone has any suggestions for replacing most or all of the eggs with something that will still bind the mixture together. I’ve tried making pancakes with mashed banana, but they rarely turn out well. I would try ground flax or chia seeds but I have absolutely no access to them (currently living in Peru). Any suggestions are appreciated! It’s hard to say what you should use in place of the eggs, especially if you do not have access to flax or chia seeds. Eggs are an important part of this recipe because the coconut flour is so dry. Eggs also provide some leaving in the pancakes too. You could try something like applesauce for part of the moisture. But I have never tried that and can’t guarantee it will turn out well. Good luck! I have the same issue with the eggs so I’ll be trying the pancakes this weekend with a mashed banana/applesauce combo and see how that sticks together. Thanks for the tips. Just made these this morning and they are FABULOUS! All paleos and non-paleos loved them- thanks so much. I made them in a Vitamix (high powered blender) which was very fast w easier clean up than hauling out the stand mixer. Also, in addition to blueberries, I did add 1 T psyllium husks to recipe (I find it makes coconut flour bake more like wheat flour- lightens it up plus it adds fiber.) The medium low heat seemed to be crucial for a medium brown (not dark) outside and fully cooked inside. I find coconut and almond flour pancakes to take quite a bit longer to cook than with other flours, so having a warm oven ready to keep them in between batches is very helpful. Thanks for the note about psyllium husks. I really need to get some of that. I’ve seen it in paleo bread recipes but didn’t think about it for pancakes. Thanks for the description of your cooking techniques too. Glad you liked the pancakes. Sooo didnt work for me, but lesson learned from todays exercise: shredded coconut isnt the same thing as coconut flour! Yeah, shredded coconut and coconut flour are definitely two completely different things. That’s a bummer. Better luck next time! Really wanted these to work this morning. First batter was too thin, and then too thick. I guess I will just have to keep practicing with the coconut flour! I woke up with a major hankering for pancakes. These are by far the best pancakes I have ever eaten in my life!!!! Wow Jenn, that’s quite a testimonial! Thanks. On the second back I added a 1/2 cup of blueberries to the batter – YUM-O! I have a slightly different recipe but learned the other day that if I cook the pancake mixture in the waffle maker, we now have “bread” again. Great with hamburgers, lunchmeat and cheese, almond butter and fruit spread….many wonderful uses. These were a huge hit at breakfast today. Used honey as I had no coconut nectar. Kefir replaced the coconut milk quite nicely. Used butter with coconut oil to cook them. Very good. THat’s really interesting. I’ve never thought of using Kefir to replace the liquid but it sounds like a great idea. Thanks for sharing. Recently went paleo and tried a couple of recipes for coconut flour pancakes, and this by far the best! This was probably already asked in all the comments but I didn’t have the time to look through them all. Could I use coconut sugar in place of the coconut nectar? Yes, I think you could use coconut sugar with no problem. My husband loves ‘regular’ pancakes. Now that we’ve gone paleo sarurday morning pancakes are rare 🙁 but for the last few Saturdays I’ve made a paleo pancake version (& he’s made his usual.) Today I saw your challenge & made these- success!! We both loved them & they really are a true pancake consistency, fluffiness etc but better in taste. My husband had one paleo pancake taste then ate his own & agreed the paleo version was better in taste!! (Still a little off in texture he said…) anyway, Thanks for bringing Saturday morning pancakes back into our home! We both thought this recipe is great. I subbed one tsp of almond extract for one of the tsp of vanilla. they smelled and tasted amazing! I had another recipe that was my go to favorite for pancakes. But it was made with almond flour and that is a little rough on my digestion. These will now be my go to for pancakes! Oh and a little pumpkin with some pumpkin pie spice also works for a variation! Yummy! Thank you! Yum! I love the almond extract idea. I’ll be trying that. Thanks! Do try it! You won’t regret it! Here is a tricky question for you. Is there a way to replace the eggs in this recipe? I have an egg allergy. Well, it’s tough to leave eggs out of recipes that use mainly coconut flour. However, even though I have never tried it, it might be worth trying “flax eggs” in place of the eggs in this recipe. In case you have never made flax eggs here is a post about how to make them. Good luck. If you try it please let us know how things go! Yummo! I used honey since I didn’t have the nectar. I made a half batch and ended up eating them all. Oops lol. Great recipe! Very impressive post specially the comparision chart of coconut and wheat flour is awesme. Awesome! I cooked these according to recipe, substituting 1 Tbsp agave nectar for the coconut nectar. I cooked on an electric griddle at 325. Found that 2-3 inches was best size for flipping. I got about 22 pancakes per batch at this size. I calculated net carbs on these at about 1 net carb per pancake. Not sure what serving size should be, but 5 pancakes made a great 5 carb breakfast with my coffee. And my 11 yo son gobbled them up with a little agave on top of his. I thought they were yummy without any additional syrup. Thanks so much for this awesome recipe! Sorry, you can’t substitute other flours 1:1 with coconut flour. Coconut flour is much drier and you need a lot less of it. I’m sure you can make pancakes with rice flour but I’m not sure of the ratio since I do not cook with rice flour myself. I suggest you search for a different type of gluten-free pancake recipe if you do not have coconut flour. I have a recipe for banana pancakes that uses mostly almond flour if you have that. You can find it in the recipe index. Good luck. WOW! I just made these. They were so good. My youngest son is allergic to tree nuts, it’s hard to find recipes without the almond flour. Thanks so much for posting this recipe. It’s a keeper. These pancakes are fabulous. They’ve become my Sunday morning treat. I love them with blueberries added – delicious! I used almond milk and honey instead of coconut milk and coconut nectar, because it’s what I had. I halve the recipe and still have enough for another meal or two. Thanks! You’re welcome, Rebecca. I’m glad you like them. Thanks for the feedback. 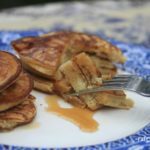 I have tried many paleo pancake recipes and this one was by far the best! My husband and I both loved them! I didn’t have soda so I just left it out and they were still delicious. We ate them with blueberries and a dollop of fresh coconut milk kefir. Thanks for sharing! Do they have the recipe for the traditional pancake recipe used in the comparison? Did they use a similar list of ingredients for comparing both the coconut flour and wheat flour? I’m currently doing a comparative study for both flours and this blog post helps a lot! Just curious about these…… Will the batter keep in the fridge for several days to say “make as you go” during the week? Or, will the keep if you cook up a bunch on Sunday and just reheat them during the week? Trying to find some make ahead breakfast! Thank you! They look fantastic. I’ve done both and it works pretty well. Of course, reheated ones aren’t exactly the same as freshly cooked but that’s true with any type of pancake. The batter should keep in the fridge for a few days too. I have frozen leftover pancakes in ziplock baggies, in individual portio sizes. I used the last pack about a month after freezing. They were delicious. I heated them in the toaster oven.